A way to get a beautiful yard, is to install lawn sod. You can hire a professional lawn care service, but if you follow these 5 steps you can install your own healthy lawn sod and get a yard that is the envy of the neighborhood. 1)Remove Everything Else. The starting point in your lawn sod installing plan would be to clear away every bit of the old stuff. Which means old plants, roots, every single thing. The simplest way to accomplish this would be to first dig up the surface area with either a flat shovel or perhaps a large piece of heavy equipment, then to find the roots, you are going to almost certainly need to use a rototiller. This kind of apparatus can easily be leased for approximately $60 a day, depending upon the dealer, as well as based upon the size of the rototiller. It is possible to break up the top 3-6 inches of top soil in which the new lawn sod is being laid. After this stage is completed, you really should walk through the location and remove all rocks golf ball sized or bigger. This can be the excellent time for you to install a sprinkler system. Since the soil is loose, you will be capable of create trenches easily and fairly quickly. Water lines don’t have to be placed deeper than 6 inches typically, and the majority of that should be loose from the rototiller. In the event that you happen to be putting in sprinklers, how can you know precisely how high to position the heads? I definitely would not do that piece yet. I would install the water lines and then place high risers out of the ground with caps on the end so absolutely no dirt enters the system. 2) Leveling The Soil. The next part of the lawn sod laying required getting the ground precisely how you need it. It is really down to you to figure out precisely what the soil requires. In the event that the ground features a lot of clay within it, you are going to want gypsum to break it up. For those who have lousy soil, you may want to think about buying a bit of topsoil to blend or even place on top of the existing ground. You are going to also need to pound metal stakes into the soil in the corners of the lot along with a few in the center. You can then run string around every one of the stakes, stretching it snug, to enable you to tell if the soil is graded level. However, before you are going to have the ability to check if the ground is level, you initially have to be sure that the string itself is level utilizing a unique “string level”. Once you’ve pounded in the stakes and run string around all of them, use the string level and put it on the string to try to have it level. After you’ve accomplished this to all of the string on the grid, you’ll have the ability to check if the terrain is level. With regards to making a string grid, given that the shape of each yard is unique, you are going to simply have to choose where you should run the string. 3) Soil Amendments. This stage includes the last touches to the soil. So that you can get the dirt completely prepared for sod, you are going to need to put in what is known as soil amendments, that are generally simply particular fertilizers. You can purchase these at Home Depot or almost anywhere. Examine the instructions as well as use them appropriately, blending these into the soil and then watering once you’re done. Be sure to water the ground a couple of times. This will provide it with the opportunity to settle and for the amendments to work in. Now is the time that you are going to plan to install the sprinkler heads. Since the ground is level and ready to sod, you should install the sprinklers to ensure the heads are 1/2 inch above the ground. Sod is usually 1/2-inch-thick, therefore if each of the sprinkler heads are sticking 1/2 inch above the ground, they are going to line up beautifully with the sod. So that you can make them all to the elevation you need, unscrew the riser from the pipe and cutoff the amount of segments as it requires to acquire the appropriate elevation. Do this to each one of the sprinklers. After this, you are going to be prepared to buy the lawn sod. 4) Installing Lawn Sod. The lawn sod will come in strips which are usually 2 ft. wide and approximately 8 ft. long. This differs based upon the provider. Before you start installing lawn sod, be sure to moisten the soil and ensure that it stays like that. You will not want air pockets left between the roots of the lawn sod and the ground or the roots are going to dry out and die. Never drench the soil. Simply ensure that it stays damp. While installing the sod, start out in the furthest corner and proceed directly across the back wall. When you have an excessive amount sod in a piece or even if there are an unusual shape that you have to cut around, get a razor-sharp knife or perhaps a box cutter and then cut the sod. After that, restart on the exact same side, just don’t line the seams of the sod up in successive lines. The lines of the strips of sod should never fall in line. This helps it grow in good without any discrepancies. Whenever you arrive at a sprinkler head, you are going to want to use a razor sharp knife to cut an opening in the sod to ensure the sprinkler head will fit through. Continue going in such a manner, making certain to always keep the soil damp along the way. It is really vital that you install the sod fairly quick, particularly on a warm dry day. It truly is crucial that you water the lawn sod which you have just placed along the way. Every half an hour, spray the freshly laid sod with a couple of seconds spray of water. 5) Lawn Sod Roller. The last step of the lawn sod installing adventure is by using a sod roller. This stage is not entirely required, but the majority of people suggest it mainly because it removes almost any probable air pockets and ensures there exists suitable contact between the roots of the sod and the ground beneath. Nearly all rollers are hollow plastic that you simply fill up with water to cause them to become quite heavy. They will be able to typically be leased, most likely from the exact same location you rented the rototiller from. Simply make a single pass on the sod. 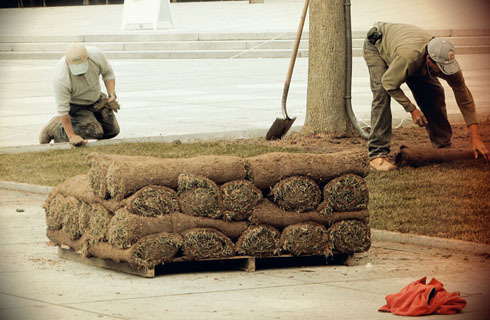 You will not want to excessively walk on the sod or roll it. Simply passing the roller over it one time ought to be enough. At this point you will have a beautifully finished sod lawn! Make sure to water it at least one time every day, based upon the weather. The retailer who you get the law sod from will understand particularly how frequently it must be watered. Let’s hope your sod transforms your yard and provides you with an exquisite lawn.